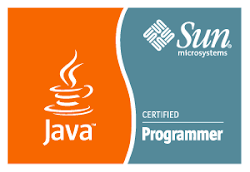 Anyone who has developed a JEE or SOA application, sooner or later faces some kind of unexpected, or strange behaviour of the system under development. However helpful the audit process screens of the weblogic server, once you enter and submit the sometimes numerous input values, one is not allowed to tamper with the request values anymore; you just wait until you get hopefully a response, or an error. 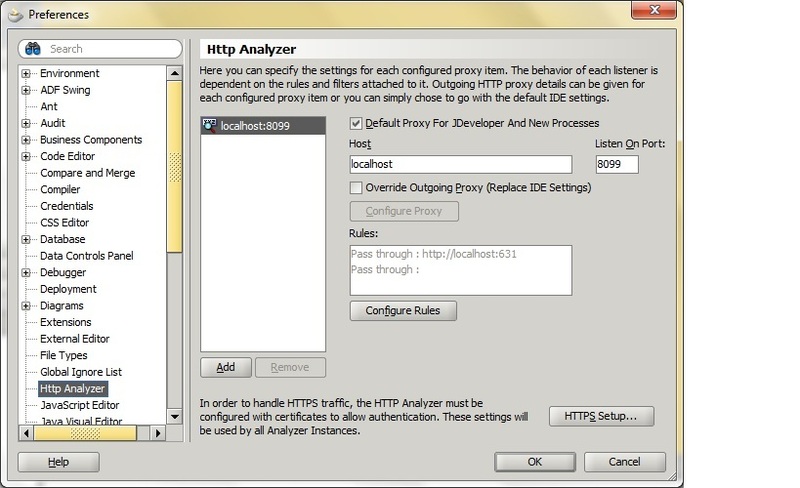 An interesting , but often overlooked, alternative is Http Analyzer. It lets you save some time, by copying the request so that you don't have to enter all values from scratch, you can edit the value of interest and resend your modified request. Let's see some specific examples. 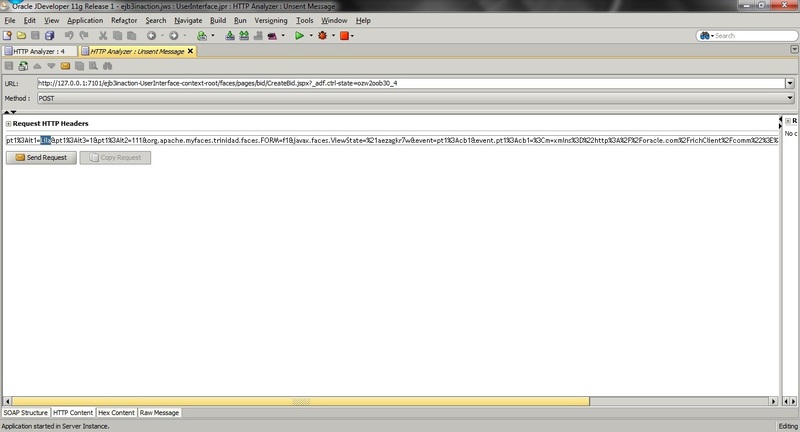 In order to quickly set it up, you go to "Tools" menu and click on "Preferences" in JDeveloper 11g as shown in the image. You need to copy the "Listen on port" value, which is 8099. Next, you need to setup the browser of your choice. The images below show the screen shots for Mozilla Firefox, I suppose finding your way in IE or other browser won't be such an onerous task! Again click on "Options", then on "Advanced", "Network" and lastly on "Settings" to reach the connection settings window as shown . 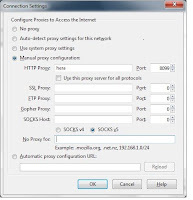 You need to select "Manual proxy configuration", enter your computer name, and paste the port number you copied before, i.e 8099. 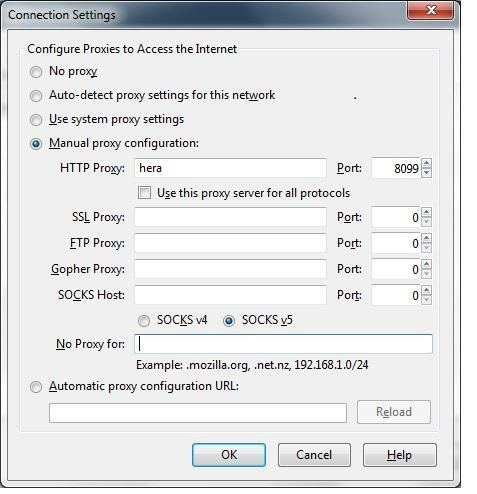 The "No proxy for" section must not contain any entries, such as localhost, nor 127.0.0.1, because in that case Http Analyzer will only analyze your internet requests! When you are done with debugging, you might need to reenter here your old values. That means you need to save them, i.e in a new back up text file! 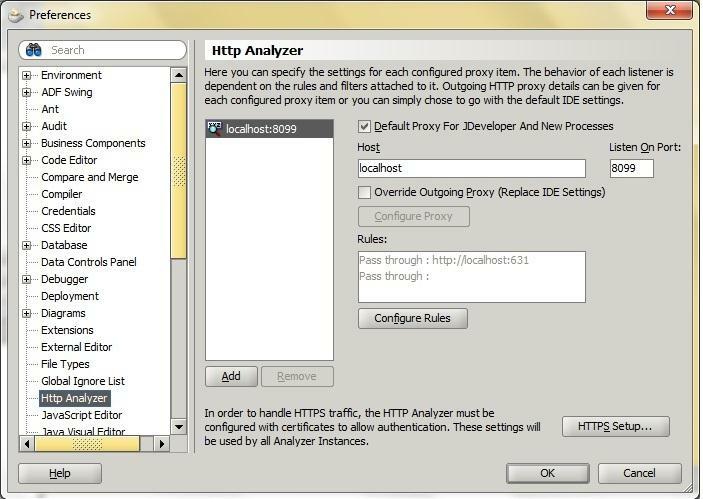 For an alternative more elegant configuration using profiles, you can consult the JDeveloper documentation, by searching for"Configuring External Web Browsers"
Next, you start the application, using the "Run project" button, and click the "Start HTTP analyzer" button. The small form of the ADF ejb bidding application window appears. You should now see the output in the log window. If you enter the form values and submit, the HTTP analyzer captures all submitted values. You can now copy the request, edit only the bidder's name for instance, and resend. For the second example, you need to reenter your old settings to your browser(i.e. No proxy). 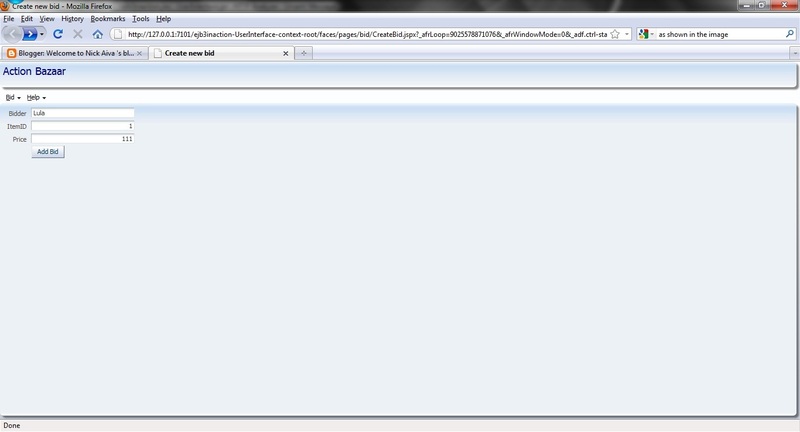 The request values will be submitted by JDeveloper itself, by right clicking on the service, as shown. Here a US stock exchange price in dollars, i.e. for OTE or GE, is converted into a different currency, i.e. EUR or GBP for British pounds. You can see the request and response values as well. As mentioned before, you need to copy the request, modify only where necessary and resubmit. Although the examples given are deliberately simple, a small relevant quotation will be given, concerning the importance of retaining the input parameters, and another alternative as well. I quote from the Oracle SOA Suite 11g Developer's guide: "If you have a very complicated interface, you may not want to have to enter the parameter values every time you test the composite. 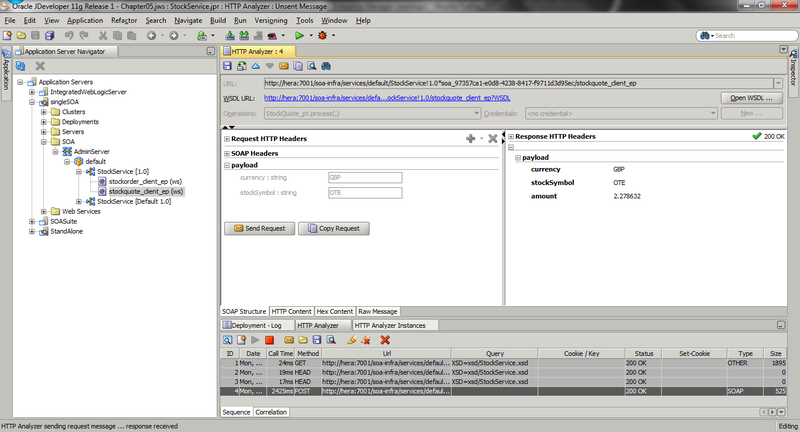 In 10g, there was a facility to set a default input to a BPEL process. Unfortunately, there is no such facility for 11g composites. In order to avoid retyping complex inputs, the input can be saved to a file and then pasted into the test dialog every time...". Finally, if your needs are bigger, you might consider another alternative testing tool like SOAPUI which is available online. You are great ! Nobody has explained this clearly about setting up HTTP analyser and proxy. Today you really helped me to confirm that my soap request is getting messed up in the transition. Thanks a log for your very helpful blog.